During the surveys undertaken by Hayden in North America in 1855, a tooth was found which appeared to be that of a carnivorous dinosaur. Leidy had named it Aublysodon - probably the first carnivorous dinosaur to be found in the US.. In 1866, in Barnesboro (New Jersey), the fossil remains of a new dinosaur were discovered. Edward Cope believed it to be very similar to Megalosaurus, and named it Laelaps aquilunguis. The carnivorous enemy of North American Hadrosaurus was thus found, being the equivalent of Aublysodon and Trachodon of Nebraska, or the Megalosaurus and Iguanodon of Europe. Laelaps stands in the foreground of this reconstruction, with Elasmosaurus ( a marine reptile) , and Hadrosaurus feeding from a tree in the background. 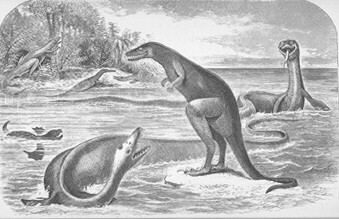 Edward Drinker Cope: 'The fossil reptiles of New Jersey' in American Naturalist, vol. 3 (1869) pp.84-91. Laelaps aquilungis was later renamed Dryptosaurus.